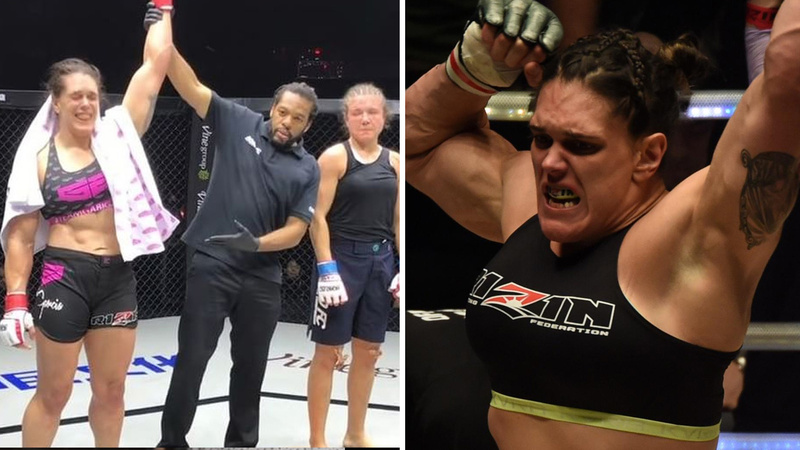 Despite it was Veronica Futina’s MMA debut, she really gave a hard time to Gabi Garcia in the stand-up. Gabi might hit the Russian with a lucky jab and put the fight to the ground early on. And when such a strong girl like Garcia, a former BJJ champion of the world, establishes full mount, you basically have no chances of escaping! Gabi landed some skull crushing shots from the mount but Futina defended to a half guard, leaving herself open for Kimura. Despite the first successful defense, Gabi Garcia switched to a straight armbar attempt. Futina defended again but gave her back, which enabled a textbook rear-naked choke victory to a Brazilian superstar. Gabi weighed 235.2 pounds before the match, while Futina had only 190.9 pounds. A significant weight and muscle difference! Gabi Garcia improved her professional MMA score to 5-0-0, 1 NC.